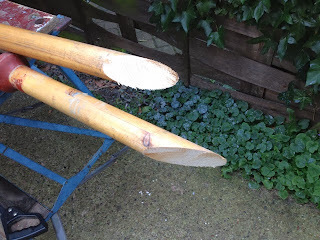 Having sawn off the tip of the yuloh’s blade yesterday, I had the will and heart to saw through the shaft today to remove a wedge from it for the purpose of imparting curvature to the shaft. I felt pretty confident that what I was doing was right. 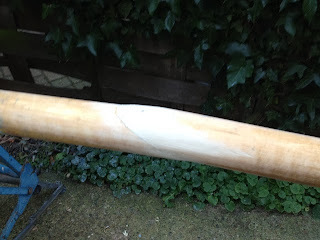 The shaft had to have a bend put into it to continue the curvature from blade to handle. The whole thing now looks right - apart from the blade, which may be a little too wide. This adjustment allows the yuloh to nestle beside the coachroof out of harms way on the starboard side, but I shall have to make supports for retaining it there. The boat plans show a loop of brass tubing adjacent to the aft end of the coachroof, and a smaller loop on the foredeck for securing the end of the shaft. I believe the trickiest part of modifying the yuloh to improve its efficiency, will be adding a pivot cup. 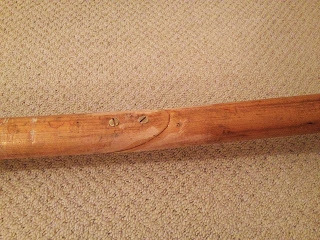 I never liked the idea of putting the yuloh into a rowlock, because of friction between them, resulting in wear to the shaft. As it is, the shaft has been damaged for this very reason. The pivot cap has to be located deep into the shaft for retaining the yuloh. I think it’s probably better to have the hole for the cap drilled into the shaft at an angle, so that the yuloh can be hooked onto the pivot pin. The buoyancy of the blade and lower end of the shaft will tend to thrust the yuloh upwards; therefore a restraining line tensioned by a bungee may be required to prevent it parting from the pin. 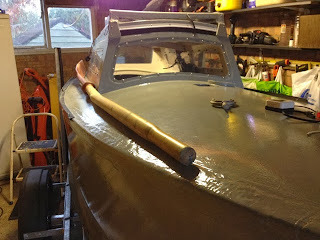 Really following your work/mods to your yuloh closely as I was not planning on having an outboard motor onboard Puffin. I would like one but I don't want petrol anywhere. I will consider making a yuloh and learning how to use it. I never did well with the yuloh on 'Faith', but her new owner modified it by giving the shaft more curvature. This made a lot of difference, to the extent that he very seldom has to resort to the outboard.